It is is an interdisciplinary space on campus open to all students, faculty, and staff. 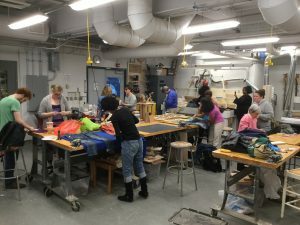 It has a full wood shop and digital fabrication lab with 3d Printers, Laser Cutter, 3D Scanner, sewing machine and more. It is located in Beardsley Hall 101-102. Email rprigod1@swarthmore.edu or just drop by someone will be there to assist you. It is for personal projects or academic ones, but priority is given to classes using the space. 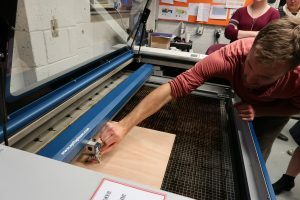 Since opening in spring 2018 the MakerSpace has held a series of workshops Wednesday evenings from 5:30-7:30 pm. 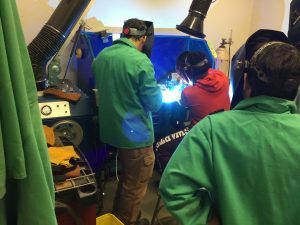 Each week there is a hands on workshop open to students, faculty, and staff ranging in topics from 3D Printing to welding, but they fill up fast so be sure to sign up. To register check the weekly email for the upcoming event and sign up with the link attached. For an overview of the workshops check the MakerSpace webpage. These are a great way to learn a new skill, meet people from across campus or just get introduced to the space. 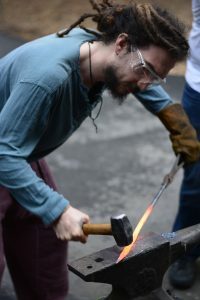 Many of the workshops are held by MakerSpace manager Russell Prigodich, but folks from Engineering, Theater and other departments have also contributed their time and expertise to the workshops. Thanks!